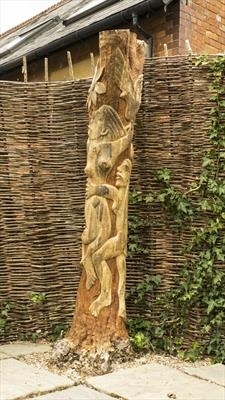 It's a relief carving wrapped around a dead holly tree trunk. Situated in the client's back garden. This is the first time I have carved a tree trunk. An interesting task I was excited to take on. Nice work in the hot dry weather of Summer 2018. I had a free hand in the choice of imagery so I came out with a design that suited the context and exercised my drawing abilities.